As we near a month of continuous travel on the Pacific, the moments of beauty and wonder are interspersed with moments of disappointment and reality. The night shifts were the most surreal and magical so far. The sky was a star studded galaxy. We saw a satellite gliding above us and astonishingly bright shooting stars. There was no moon and no wind. The ocean was still and I never knew she could actually be so still. When Ems and I stopped rowing to breathe in the beauty, it was the deepest and most peaceful silence I’ve ever heard. During every daytime rowing shift that passed by today, the constant in my view as I stared at the expanse of the water stretching around me in all directions, was plastic. We have seen numerous pieces of varying sized plastic debris floating by on a daily basis but the frequency at which we have now started seeing this debris is quite alarming. We are the furthest away from land we have been so far. We have not seen any boats for over a week and the only wildlife we have spotted is the odd albatross, shearwater, 2 unidentifiable fish and a small crab hitching a ride on a piece of small white plastic. The Pacific Ocean is the largest, the deepest and the oldest ocean in the world. It covers nearly half of the Earth’s water surface and about 32% of its total surface area. It is larger than all of the Earth’s land area combined and at its deepest point, it is more than the height of Mt Everest. The almighty Pacific is a very special place but the distressing realisation that is that it is becoming one of the world’s largest rubbish tips is a sad but very real fact. They say between 8 and 9 million tons of plastic enters the ocean each year. There are some areas, known as gyres, where circular currents converge that are known to be specific spots where a lot of this plastic collects. Each of the major oceans have plastic-filled gyres. 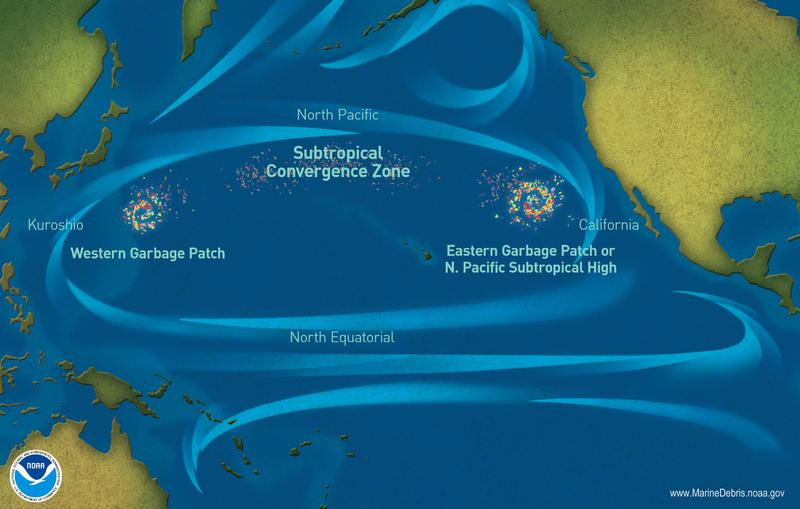 There are gyres in the Northern Pacific, as well as what is commonly known as the ‘Great Pacific garbage patch’ and at least 5 trillion pieces of plastic! This plastic pollution affects the environment, the economy and also our health. Seabirds, marine mammals and certain eco systems all are under great threat. Huge amounts of money is spent every year in an attempt to clean up coastlines and within fishing, shipping and tourism. There are chemicals contained within plastics, as well as various pollutants that plastic can attract once it is in the marine environment. When I did a Pacific crossing on a sailing expedition boat in 2012, we were actually monitoring plastic pollution amongst other things. For this journey, I joined the lovely Emily Penn who is an expert in this area of pollution, and friend and fellow adventurer, Dave Cornthwaite. From the small amount of trawling we did, we managed to catch and dissect small fish and found that all of them had ingested many tiny pieces of plastic (micro plastic). Toxic chemicals are absorbed by the plastic and after entering the food chain, can be found inside these fish, including ones consumed by humans. Some of the health effects linked to these chemicals are cancer. It was an eye-opening experience and equally, so has the row been so far. When you travel at the slow speed that we are moving, you see everything that moves in and around you in the ocean. I’ve seen large pieces of plastic float by and when I look closely in the brilliantly blue waters, I see the very small pieces of plastic too. I can’t imagine. What a shame. Did you get any pictures?. I am sorry that on such a wonderful journey you have to look at that trash. How very depressing that little read was. We are all contributing in our daily lives, to the destruction of this beautiful planet. The amount of non biodegradable waste we produce is ridiculous. Why does a fresh broccoli need to be vacuum sealed in plastic? I hope that we can one day undo the harm we have done but I believe we have already gone well past the point of no return. Just goes to show. The magic silence of a vast calm ocean hundreds of miles from land no boats in sight or aircraft trails overhead yet surrounded by everyday flotsam and jetsam discarded by humanity. Question is, how does it get into the ocean. What is floating in the water is only part what is actually dumped. The rest is discarded on land and in land fill. Some is recycled; I have a fleece made from plastic botles. The overall plastics plague is huge but the greatest harm is done where it enters the food chain in the oceans. We can learn from the Maldive archipelago where there is a strict waste regime. Recycling is effective and waste from each inhabited island is collected and dumped on an inverted landfill island near the capital. Tourists are encouraged to take their empty suntan lotion bottles home with them and to minimise wrappings and packets that they bring with them. 3rd hurricane of the NE Pacific hurricane season is taking nearly same track as Blanca before it towards Cabo San Lucas. Andres number 1 headed NW further out into the Pacific before swinging East. Mention of Dave Cornthwaite! My daughter did the second half of the skateboard journey across Australia with him and his team. Amazing experience. The plastic and rubbish floating in our seas is shocking, and that’s just the surface, I’d hate to see what’s happening under the waves!! One of the worst pollutants were putting into our oceans is small plastic micro beads. These beads are in cosmetics we use at home and wash down the sink, bath etc Please check any exfoliating products you purchase use natural ingredients like coconut she’ll and not micro plastic beads.